In southern Indiana, we are between generations of striped cucumber beetles. That doesn’t mean there are none out there, but numbers are lower than they were and lower than they will be. The second generation should be coming out soon. Northern areas are a little behind. 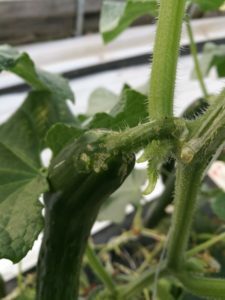 The biggest concern we have with the first generation or overwintering cucumber beetles is their ability to feed on seedlings and to transmit the pathogen that causes bacterial wilt to cantaloupes and cucumbers. For the second generation, we are less concerned about bacterial wilt and more concerned about feeding damage to the fruit, particularly watermelons and cucumbers. If you are seeing beetle feeding on fruit, you should probably apply an insecticide to protect the fruit. If not, you are probably safe not spraying. For later planted pumpkins, the biggest concern is feeding on the plants in the seedling stage. Once the plants get larger, they are less susceptible to attack. Again, if feeding damage on the fruit is observed, treatment is recommended.